T-Series has come up with another Sunny Leone masala flick with their regular assorted composers in the form of Meet Bros Anjjan, Amaal Mallik, Dr. Zeus, Tony Kakkar and a not-so-regular Uzair Jaswal. CLICK HERE to buy Full Soundtrack of Ek Paheli Leela from iTUNES!! 1. Desi Look – Singer: Kanika Kapoor; Music: Dr. Zeus; Lyrics: Kumaar – I wish Dr. Zeus someday atleast TRY to create something different. He doesn’t even try. Producers must be after him to make more and more Lovelys. They don’t even think of changing the voice. Kanika Kapoor is the ultimate choice these days for these kind of songs. Similar beats, similar rhythm and similar style of singing make this track exactly similar to all the recent Dr Zeus compositions. Yet, if you don’t compare it to his previous compositions, it’s a nice one! 2. Tere Bin Nahi Laage (Male) / Tere Bin Nahi Laage – Singer: Uzair Jaswal / Tulsi Kumar, Alam Khan, Aishwarya Majmudar, Daboo Malik; Original Music: Uzair Jaswal; Recreated by Amaal Mallik; Lyrics: Kumaar – If you have this habit of listening to repetitive styled compositions, you must hear the male version. The way Uzair Jaswal has sung is so typical that I could relate it to any of today’s romantic songs. What surprisingly good is the other version which comprises of Tulsi Kumar in the lead. Aishwarya’s starting rendition is fabulous. Alam is another attraction in this version as he gives some folksy touch with his vocals. Kumaar’s good lyrics is a bonus. The new portions are brilliantly composed and arranged by Amaal Mallik. Extremely ordinary, not extremely melodious. 3. Saiyaan Superstar – Singer: Tulsi Kumaar; Music: Amaal Mallik; Lyrics: Kumaar – The most surprising and shocking element here is Tulsi Kumar who sang with such amazing vocals that didn’t at all annoy. Amaal’s playful composition is catchy enough to hold you where you are draw you towards itself. The techno sound tune, is addictive. Lyrics are ordinary and do not need to be mentioned. Tulsi Kumar surprises!!! 4. Khuda Bhi – Singer: Mohit Chauhan; Music: Tony Kakkar; Lyrics: Manoj Muntashir – The track seems to be over-cooked. It has been mixed and mastered much more than what it actually needed. The composition is really nice. It is catchy as well as melodious. Mohit Chauhan is always brilliant and so is the Flute. Lyrics do create an impact. Very well written by Manoj Muntashir. Worth attempting! 5. Glamorous Akhiyaan – Singers: Krishna Beura, Meet Bros Anjjan; Music: Meet Bros Anjjan; Lyrics: Kumaar – One by lyrics, feels it to be a dance number but it’s a song with a Sufi touch awesomely handled by Krishna. This too sounds over-mastered to me. While we were hearing all the similar types of dance numbers from them, Meet Bros Anjjan finally switch to something more creative which they are actually capable of. Applauding attempt by Meet Bros Anjjan! 7. Dhol Baaje – Singers: Monali Thakur, Backing Vocals: Meet Bros Anjjan, Ved, Ambresh, Ashish; Music: Meet Bros Anjjan; Lyrics: Kumaar – Monali is the show stealer. Whatever goodness you find in this track, it is because of her singing. The remake anyway is not at all bad. It is definitely not of the level of the original, still it atleast doesn’t spoil the legacy of the original, it just remains to be a good decent track and a very good track if not compared to the original. Again a great remake effort by Meet Bros Anjjan. 8. Ek Do Teen Chaar – Singers: Neha Kakkar, Tony Kakkar; Music: Tony Kakkar; Lyrics: Tony Kakkar – A very tiresome attempt from Tony. Neither it offers good tune for pleasurable listening nor it offers beats good enough to dance. Lyrics too fail to impress. Hence, it turns out to be dull. The album is good to attract the crowd. April 3, 2015 by Dreamz Unlimited! It doesn’t happen normally that you get to hear an album consisting of eight songs by eight different composers unless it is a T-Series album. They hired eight composers for this small film, you wonder why, after listening to the album. CLICK HERE to buy Full Soundtrack of Dilliwaali Zaalim Girlfriend from iTUNES!! 1. Birthday Bash – Singers: Yo Yo Honey Singh, Alfaaz; Music: Yo Yo Honey Singh; Lyrics: Alfaaz – After reaching to a certain level of creativity, Honey Singh has again returned to his standard dance numbers that become so monotonous after a certain period of time that you just feel like stopping it. Alfaaz’s lyric writing is even worse than that of Honey Singh. The song is not able to covey anything, not even the zaalimness of the girlfriend properly. Highly monotonous! 2. Tipsy Hogai – Singers: Rajveer Singh, Miss Pooja; Music: Dr. Zeus; Lyrics: Zora Randhawa, Mavi Bains – Assembly has yet another repetitive composer who just tried to renovate the Happy New Year song Lovely. You clearly find instances where you just about to croon the line main lovely ho gayi. No wonder the lyrics also didn’t change much. It just renovated from lovely ho gayi to tipsy ho gayi. I am amazed by the amount of hard work that Dr. Zeus has done in this song. What a renovation, or just a recreation, or whatever it is! 3. Zaalim Dilli – Singers: Jazzy B, Hard Kaur; Music: Tiger Style; Lyrics: Bunty Bains – Tiger Style is a Scottish Punjabi music group from the British background. They have numerous albums to their credit and this is supposed to be their Bollywood debut and not an impressive one, I should say. The composition is quite staid and fails to hold the listeners for long. Their style seems to be similar with that of Manj Muzic. Jazzy B and Hard Kaur excels but the composition fails to impress. 4. Tere Liye – Singers: Indeep Bakshi, Soni B; Music: Indeep Bakshi; Lyrics: Indeep Bakshi – A very stereotypical romantic track that relies highly on the techno beats and autotuning. Indeep Bakshi although has handled all the three departments but sadly fails to impress in any of them. Soni B has a small portion which she performs decently. Composition is nice though it doesn’t have the ability to retain itself for long as the song is totally a result of machine work. 6. Meri Marzi, Teri Raza – Singers: K Mohan, Meet Bros Anjjan; Music: Meet Bros Anjjan; Lyrics: Kumaar – Fortunate listeners who are reading this review, can skip all those above tracks and listen to songs like Janib and this one. It’s vague to expect a serious song from Meet Bros Anjjan these days but thankfully they have finally attempted a serious one after a long time. K Mohan’s voice never fails to create impact although the composition could have been brighter in terms of the tunes and arrangements. Some might easily find this a boring as the only drawback it has is its long duration. 7. Saddi Dilli – Singer: Milind Gaba; Music: Milind Gaba; Lyrics: Milind Gaba – The soundtrack returns to its techno Punjabi flavor with this song describing about Delhi’s quality and speciality of Delhiites, basically giving an extremely bad impression about Delhi to the outsiders. Milind Gaba’s singing, composition both fail miserably and lyrics are not worse than to be called pathetic. Bad attempt. 8. Maa De Dandeya – Singer: Jassi Katyal; Music: Jassi Katyal; Lyrics: Kumaar – It’s a satirical song having lyrics with an agenda. Composition doesn’t seem to be having much scope. It must have been appropriate on the screen. Kumaar’s lyrics is the highlight which is good enough to engage the listeners. The rest of the department has nothing exciting to offer. Eight composers. Eight songs. Seven failed miserably. Jatinder Shah beautifully saves the album with his melodious creation. January 24, 2015 by Dreamz Unlimited! Last year it was Mithoon for whom the music label was mad using him films after films, this year it’s Ankit Tiwari who has got the most number of songs in this album besides Amaal Mallik and Meet Bros Anjjan who got one each. CLICK HERE to buy Full Soundtrack of Roy from iTUNES!! 2. Tu Hai Ki Nahi / Tu Hai Ki Nahi (Unplugged) – Singer: Ankit Tiwari / Tulsi Kumar; Music: Ankit Tiwari; Lyrics: Abhendra Kumar Upadhyay – Ankit in his cliche style, tries to create an intoxicated atmosphere which is not needed in every song and he needs to understand this fact. The song hardly leaves any impact but that whistle works enormously, attracting the listeners with its bagpipe touch and that creates a real intoxication. Apart from the whistle, song has nothing to boast about. The T-Series Sister gets the unplugged as there was no other space for her in the album and as expected, she completely spoils the mood of the song, creating a yawning atmosphere with her dull singing. Whistle is the savior. 3. Chittiyaan Kalaiyaan – Singer: Kanika Kapoor, Meet Bros Anjjan; Music: Meet Bros Anjjan; Lyrics: Kumaar Meet Bros Anjjan are constantly trying to create another Baby Doll and not just a different song which leads to all their songs sounding very similar. They are even keeping the beats very much similar, calling the same singer, collaborating with the same lyricist but another Baby Doll is not possible. It is catchy but not addictive. You won’t want to hear it on a loop as you must have had done with Baby Doll. The antara is really nice but the bar which Baby Doll has already set, is tough to be exceeded. Addiction missing! 4. Boond Boond – Singer: Ankit Tiwari; Music: Ankit Tiwari; Lyrics: Abhendra Kumar Upadhyay – Here, inspite of Ankit’s stereotypical singing, the composition is very likable specially the line main na bacha mujhme thoda sa bhi and the varying notes of antara which represents some novelty in Ankit’s compositions. The point where Ankit’s voice is echoed, sounds really awesome. Lyrics by Abhendra is another likable stuff in the song. A lot better than the hugely popular Tu Hai Ki Nahi. 5. Yaara Re – Singer: KK; Music: Ankit Tiwari; Lyrics: Sandeep Nath – Ankit saves the track from being average by not trying it in his own voice, instead, calling KK for that. KK has this potential of making an average composition, sound superb by his impeccable vocals. Moreover, it’s a delight to hear him after such a long time. It’s a KK show! You can’t skip this! The best thing in this soundtrack is Amaal Mallik’s addictive composition. The rest remains to be an average affair. January 14, 2015 by Dreamz Unlimited! Neeraj Pandey is back with another political thriller but it is the first time that he is dealing directly with terrorism whereas in A Wednesday, terrorism was pictured through a common man. Baby is the name of the operation that Akshay Kumar and team will handle in the film. Contrary to the general approach of T-Series towards their film’s music, this is a drastic step by them to have just two songs in the album, one by M.M. Kreem and the other by Meet Bros Anjjan. CLICK HERE to buy Full Soundtrack of Baby from iTUNES!! Except a mild use of Sarod, and a little bit Guitar, mostly the song deals with intense techno sounds. Apeksha is very suitable for the track and she has justified the mood of the song completely. The way she says beparwah, is the only way to create impact on the listeners. Manoj Muntashir’s satirical lyrics aptly defines the theme which the film is surrounded by. It might not please all, but the composers have come up with what best they could have. This song is all about the lyrics. Amazingly written by Manoj Muntashir in which he uses a unique concept where the lover first refuses the love for his beloved and then he puts conditions to it using par (but) and then he describes his condition without her as what happens with him, if and when he doesn’t love her. Personally, I haven’t yet come across such a uniquely romantic concept in lyrics writing. M.M. Kreem has used Violins perfectly in the background in support of the mood set by the lyrics. The composition though doesn’t satisfy me as it’s composed very differently, sounding very uncatchy. If you get pleasure in poems, grab it in your playlist! #WelcomeSong. A great compromise by T-Series which otherwise focus on music the most in the form of two good songs by Meet Bros Anjjan, M.M. Kreem and Manoj Muntashir. December 18, 2014 by Dreamz Unlimited! When you hear the name of the movie, I don’t think you want see, hear or read anything about it. Plus, if it has actors like Zayed Khan and Ranvijay Singh, your determination of ignoring it, gets stronger. The tiresome multi composer element gives enough reason to let it go. Music has been given by Meet Bros Anjjan, Dhruv Dhalla, Sandeep Chatterjee and Faridkot. CLICK HERE to buy Full Soundtrack of Sharafat Gayi Tel Lene from iTUNES!! Since selfie is in fashion, producers must have demanded Kumaar to write a song on Selfie and a song gets attractive when you add the suffix aan to it, like Azaadiyaan, Khushfehmiyaan, Manmarziyaan, Bewakoofiyaan, hence, Selfiyaan. Still the one who has to be blamed is definitely Kumaar for writing something that is completely rubbish. The word selfiyaan in any line doesn’t relate to the song. Khushboo Grewal’s part is utter nonsense, also cheap at places. Meet Bros Anjjan’s good beats save the song to some level. The tune is actually catchy with pretty decent and sensible, if not good, lyrics by Manoj Yadav. Beats have the groove but somehow, the song falls into a kind of zone that doesn’t attract listeners. While listening to these kinds of tracks, nobody cares for the lyrics. Also, these tracks neither provide foot-tapping mood nor a relaxing atmosphere. The best is that it’s of less duration. The only romantic song of the album which provides good harmonica pieces as well some nice Guitar background, sung nicely by both the singers, coordinating well, making it a decent duet. Tejpal’s lyrics are youth oriented, giving more of the feeling of non-film romantic tracks rather than of a mainstream film track. Decent attempt by Sandeep Chatterjee. The best of the album, still just a one-time listen. Title track is absolutely useless. You can easily guess this without even listening. I know I am a fool who is listening to it and then telling that it’s useless. IP Singh who sounds more like a subject than a person, has sung and written as well. Both the work are appropriate at their own level. The one to be blamed is definitely Faridkot which is not a person but a band. Akshay Rajeha and Gavin Paheco, people who have composed the song, are no longer the members of the band now. Anyway, Ignore! Except a song called Dil Ka Funda which needs your ears atleast once, none of the songs are worth giving the time. August 8, 2014 by Dreamz Unlimited! Ajay Devgan in and as Singham came like a storm at the box office. Directed by Rohit Shetty, this film collected huge applaud and collections from the audience. Even the elite viewers got entertainment. And now, Singham has returned. Although the trailer looked almost the same as that of its prequel, the action again looks very promising and full of masala. Music seems to be the only problem here. Ajay-Atul who provided soothing music to Singham, are replaced by four composers Jeet Ganguly, Ankit Tiwari, Yo Yo Honey Singh, Meet Bros Anjjan, each having one song. 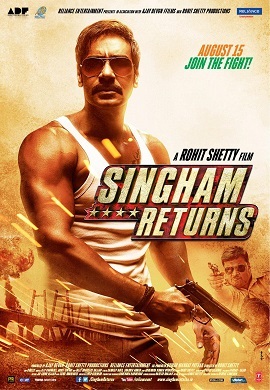 CLICK HERE to buy Full Soundtrack of Singham Returns from iTUNES!! Jeet Gangulli is back with his old habit of remaking his own Bengali compositions in Bollywood. This time it’s Mon Maajhi Re. It’s a decent melody but very similar to Jeet’s own previous song Kaafir Andhere from Shirin Farhad Ki Toh Nikal Padi. The similarity gets zoomed in the antara. Arijit has led away the song very well. He has comfortably sung the higher notes and beautifully woven them with lower ones. Jeet has used some fine Guitars to give a complete Rock feel. Sandeep Nath, if translated the lyrics, has done that really well. Typical Jeet Gangully song. The original title track by Ajay-Atul has been reinvented by Meet Bros Anjjan where they have kept the mukhda firm and completely changed the antara and all the arrangements. They have glamorized it more but kept it lighter this time. The children chorus and the horns that they have used, have a light mood and signifies that the character “Singham” is not only designed for fights but also has a softer side. They have crafted it really well and whatever was being missed by Ajay-Atul, the composers have fulfilled it all. Applauding effort! Every second T Series album has a Yo Yo track which has now seriously reached the level of awfulness. Introducing a new singer Nitu Choudhary, the song turns to a height of intolerance. The part which she got, “mala raag yetoy” is the most irritating part of the song. The rhythm is exactly similar to Lungi Dance and the starting of the song resembles Party With Bhootnaath. Mamta Sharma sounds decent in the track (which is a very surprising fact). When you mix some old Honey Singh tracks and try to make it sound pathetic, then something like Aata Majhi Satakli will be prepared. It’s vague for Honey Singh track to advise not to hear, as it always reaches the listeners and most of the time it’s unwilling. Singham Returns – Three composers. Three songs. And the fourth one is Yo Yo Honey Singh. July 17, 2014 by Dreamz Unlimited! What do you expect from the songs of a Salman Khan movie? At least two tapori songs, one extra breezy romantic song and a nautanki song where the lyricist goes mad writing nonsense lyrics and the choreographer loses its originality and lets Salman be the choreographer. But one doesn’t expect three songs sung by Salman Khan himself. Two songs are by Himesh Reshammiya, one by Meet Bros Anjjan and one by Yo Yo Honey Singh. CLICK HERE to buy Full Soundtrack of Kick from iTUNES!! This is one of those songs which gets a “hit” tag instantly and the listeners forget it probably after a month. A version sung by Mika would not impress you much and the other by Salman Khan would irritate you much. Palak has an avoidable role as she just has to always be fake Shreya Ghoshal and sing with a voice as thin as she can make it. Tune by Himesh although not very impressive, is quite engaging. Himesh has kept same arrangements in both the versions just having a difference in the starting. The Horns in Mika’s version has a more classy texture while in Salman’s version, it begins abruptly with more than enough energy. Two lyricists were needed for writing this song. This is quite an amazing joke of this year. According to rumors Shabbir Ahmed wasn’t able to write the song after the mukhda so Kumaar came on board and wrote the rest of the song. This rumor can easily be believed by seeing Shabbir Ahmed’s previous performances. Not for class, not for mass, only for wedding and only for a month or two. Surprisingly, Salman’s vocals are sounding very decent in this track. Thanks to Meet Bros Anjjan for that. You can call his voice a distorted sound of Mohit Chauhan’s voice. The composers seem to have done a good amount of work with Salman’s vocals to make it sound comfortable with Shreya Ghoshal. They have done a good use of Violin and the style of Piano is very much similar to that of Himesh Reshammiya. Also, the song is a bit long. It could have been much shorter. The line dil se kabhi na utre is the best in the song. The only thing that is not workable is Kumaar’s forcefully written lyrics. The word Hangover clearly seems to be added without any sense. A good decent romantic track spoiled by the title of the song “Hangover”. The first version by Mohd. Irfan is ofcourse good because the song is really beautiful. Raaste har jagah sirf tera pata sounds really awesome. It’s a soothing romantic song with a typical Himesh Piano along with the melodious Violin. Somehow Mohd. Irfan’s voice didn’t sound crystal clear this time. However Neeti Mohan in the Reprise version also held the song very well with obviously in a different scale. Lyrics by Mayur Puri is the highlight of this song. The way he has laid the words on Himesh’s tune is damn perfect. Lyrics in antara are also composition oriented and likable. Salman Khan somehow didn’t sound as good as he did in Hangover. Salman makes this composition a little staid so avoid Salman’s version and you are left with the other two. Honey Singh should stop his discoveries of finding new singers. Whoever this Jasmine Sandlas is, she is simply pathetic. The composition gets included in the list of worst songs by Honey Singh. This singer makes it even worse. Honey Singh has also given her the lead role and kept satisfied himself with the rap. If not tune, beats are always a speciality in a Honey Singh song but it is the first time that his song has disappointed in this department also. One of the worst songs of Yo Yo Honey Singh. You can call this a sad version of Hangover as similar traits can be found here specially the line Hangover sung by Shreya Ghoshal. Although there are two version among which one of them is by Salman, you won’t be able to crack much difference in the singing of both the versions. Salman’s voice has strictly been auto tuned. Mohd. Irfan is very much in his original form and sounded quite decent in this beautiful composition by Meet Bros Anjjan. They have used Violin in almost the whole song and style is very much similar to that of Hangover. Kumaar has also written it nicely. Rhythm is beautifully soothing. Definitely the #WelcomeSong. 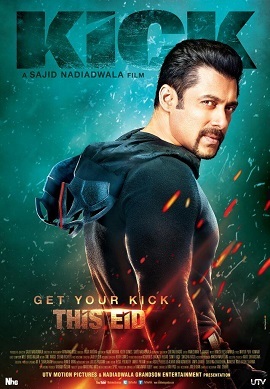 Kick – This album is filled with numerous versions having just four songs among which three have been sung by Salman Khan himself. His voice in two of them have sounded bad but the one by Meet Bros Anjjan has surprisingly sounded very decent. Overall, Mayur Puri gave the best performance in the whole album as he got just one song to write and he wrote it excellently. No wonder these are Salman Khan film’s songs. Cheap (Jumme Ki Raat), Nonsense (Hangover) and Pathetic (Yaar Naa Miley) but responsibly saved by Himesh Reshammiya’s Tu Hi Tu and Meet Bros Anjjan’s Hai Yehi Zindagi. Better than recent Salman’s film’s albums.